MOUNT VERNON, Iowa—President Barack Obama's senior campaign adviser moved to dispel the notion that GOP nominee Mitt Romney took votes from Obama in October, and questioned two national polls showing growing support for the challenger. 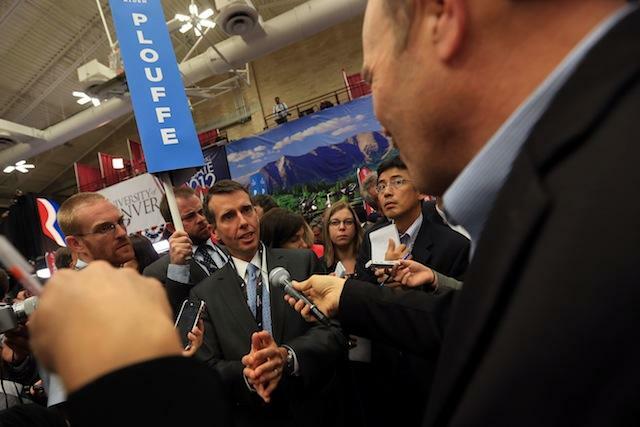 Speaking to reporters on the press charter bus while leaving the presidential debate at Hofstra University on Long Island late Tuesday night, Obama adviser David Plouffe said most of the uptick in support for Romney came from voters who were going to support him anyway. "What's happened here is Romney's picked up some. That is almost all gains that we knew he was going to get," Plouffe said. He added that Romney's first debate performance probably influenced voters in October. "So he captured a bunch of Republican-leaning independents. This is the race we expected all along. "He's not taking votes away from the president," Plouffe went on to say. Both national and battleground state surveys suggest that Romney has moved to close the gap with the president, who has enjoyed a lead over the Republican challenger since he was nominated this summer. The Real Clear Politics poll average shows Romney and Obama now tied at 47 percent nationally, and the Gallup poll of likely voters released on Tuesday showed Romney leading the president, 50 to 46 percent. To the surprise of many political observers, a USA Today poll even showed Romney leading among women, which Plouffe dismissed. "With all due respect to USA Today, they're running this flawed poll that has us tied with women, which is an impossibility," Plouffe said, before turning to Gallup. "Gallup has a terrible likely voter screen," he said. "Gallup's been erratic all year. Even when it's benefited us it's been way too high. By the way, there's not that much movement. There's very few undecided voters. The USA Today thing ... they probably had a too-conservative skew amongst women voters."